We grow apples and make cider. We believe in simplicity and attentive choices in the orchard and cidery. Local fruit, place, and time are the ingredients. 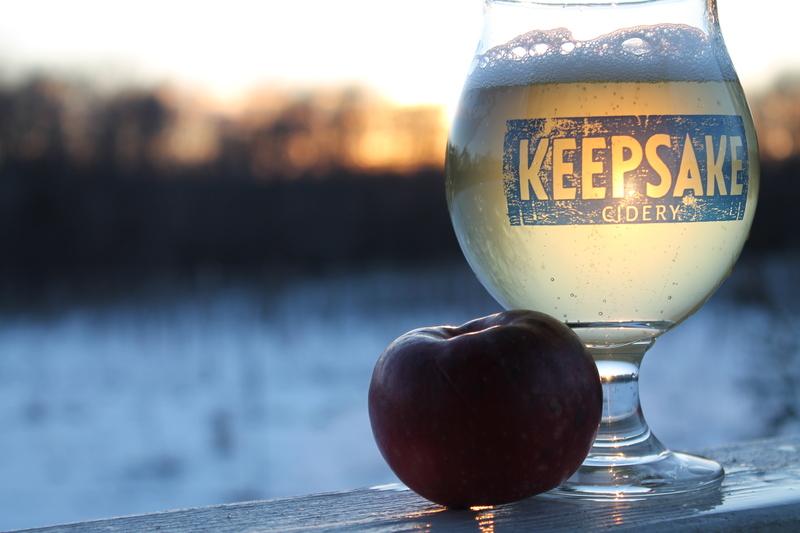 We put our hearts into crafting a Keepsake cider that we hope you will enjoy . We’re excited to share this favorite. A bright yet earthy, slightly tannic cider made with wild yeasts and a unique blend of local organic apples. Think of the perfect cider for weathering a storm at a pub in Scotland. Hints of toffee, rose, leather, medium body. Wild yeast and apples from one Minnesota orchard. Plum Crazy. Wild is our zippy, full spirited cider. bright eyed and bushy tailed. Local dessert and crab apples fermented with native yeasts. Aged 7 months in stainless tanks then bottled and conditioned with residual sugars for natural bubble. We taste sour tropical fruit, wildflowers, and a bit of wood. Aged on black currants and aronia berries from our farm. Sweetened with fresh cider from our press. A lot of thought goes into sourcing and growing our apples. Nate can be found ranging between technical and philosophical. This is an art from start to finish and there’s something new to learn every time you visit. Come to the tasting room and try our full line of ciders, including special batches only available at the cidery. Ciders will range from medium sweetnes to bone dry, from tannic apple to sour cherry, from sparkling to still. Each has its own voice and story- All from local fruit, unfiltered, and ready to enjoy! There’s all kinds of local fare to nibble or devour. Imagine if each of your neighbors raised and grew a different savory treat. They pack up the freshest of their cheese, vegetables, and pastries to cart over to a cozy parlor every day. At the cidery, one of us will lovingly combine all these local ingredients into scrumptious toasties, soups, and more. They changed my mind about cider. Thanks for serving up tasty beverages and education about making cider! Best cider, and the best kind of “apple nerds”. Period. We are a family owned cidery, orchard, and tasting room. Our aim is to produce delicious, high quality cider from simple ingredients and time honored methods. Farmer, cider maker, and janitor. While living in upstate New York as a boy, his first successful business involved selling apples from a neighbor’s tree. He made over three dollars in one day, not bad for a farmer! Maybe it was this wild success that planted the orchard seed in his heart. As he grew older, he dreamed of starting an orchard and a farm brewery. After enjoying ciders from around the world, he decided to combine dreams and start a farm cidery in Minnesota. Nate is thankful for the crucial advice of apple growers like Bob Barthel and cider makers like Tom Oliver, plus plenty of books, classes, and batches upon batches of practice in the early days with Jim Bovino. When not growing apples or making cider, he can be found writing, putzing around, playing soccer, or wandering through the woods with he and Tracy’s most important crop- Tristan and Fiona. Born and raised in the upper Midwest on a small farm in the woods. Through young adulthood she developed a firm belief in hard work, the power of community, and a deep respect for the earth. After joining forces with Nate, they built their life around those philosophies, putting down roots (literally) in the Cannon Valley Region of Minnesota. Jump in and ask her about the detritus in the woods, or almost any nuanced question on the region. It’s a great free education for the seekers and listeners. Orchardists in training, Tristan & Fiona, were born just before Keepsake and keep busy chasing butterflies and eating apples. When Tracy is not working on the farm, raising kids or slinging cider, she works as an Emergency Medicine Doctor. Many a storm has come through, but the dene foliage has helped protect our orchard, home, and tasting room. We are a ZONE 4 growing region, meaning it can get pretty darn cold. Interestingly, it can also be extremely hot. Weather and farming in Minnesota is a challenging roller coaster, but also contributes to great apple orchard health. Frosty winters do a number on pests, aiding in organic farming practices. Cool nights in the fall are perfect for apples. The apples react to tough conditions in interesting ways, and you’ll taste it in our cider. Long ago our farm was buried by an ocean and the valley was created by glacial melt. Our orchard is located on top of a bluff overlooking the Cannon River Valley. Our fertile topsoil rests atop sandstone, shale, and limestone. We can’t wait for our apple and grapes to get their roots down into the stone. Surrounded by the Cannon River Wilderness Park, we are constantly in sight of old growth forest. Basswood, oak, maple, elm, and ash are the dominant species, but there is a diverse number of flora in the park, including the wild apple! The forest is a big reason we live here. We are lucky to have the protection from the wind and the constant calming presence that only a giant tree can bring. A variety of species can be found here. Deer, turkey, possum, raccoons, fox, butterflies, dragon flies, tree frogs, blue bees, leopard frogs, fox snakes, garter snakes, bald eagles, toads, rabbits, fire flies, pocket gophers, red tail hawks, bumble bees, and mosquitos are all neighbors who frequent or actually live on the farm. Other less common neighbors are skunks, badgers, pheasants, praying mantis’, wood frogs, wood turtles, and great horned owls. All are welcome except for a few pests in the orchard. In fact we gauge the health of the orchard and farm on how much wildlife we see!